Valentino Rossi born racer Urbino, Italy February 16, 1979 was a racer in the world motor racing Grandprix after the era of Michael Doohan with the title of world champion in four different classes, achieved during the seven-year career. The son of former 250cc Grand Prix racer Graziano Rossi and Stefania Palma has had a lot of records and achievements that go beyond the senior. This eccentric driver posted a total of seven world titles: once in the 125cc class, once in the 250cc class, five times in the top class, 500cc and Moto GP. Throughout his career GP Rossi always wore the number 46, he wore that number after watching the action of a Japanese wildcard rider number 46 on TV that makes it seem. Moreover, the number is also used by Graziano Rossi, father, when Morbidelli won the first race of the year 1979. Today he still wore the number 46 kebanggaanya it and do not follow the world champion, world champion before that choose to change the number 1 after a world championship title. When I first joined the 500cc Gp team with Doohan former is headed by a reliable mechanic named Jerremy Burgess Australia, the atmosphere is affected paddock Doohan temperament temperamental. All mechanics and staff teams tend to look serious and stressful. This atmosphere makes Rossi determined to celebrate when a massive win. Since then, a victory party became his trademark. Not just with friends, as well as thousands of supporters who packed the circuit. He also conducts Action "wheelie" and "burnout" if it gained the victory, and often provide "kneepad" or to the fans to throw hats while on the podium. In his racing career, Rossi always changing nicknames and do things that attract attention and entertain. He reasoned that it was all done with the intention of having fun and doing something funny. "Rossifumi", the nickname given by his friend Rossi at Rossi raced in the 125cc class. The nickname was created by Rossi impressed with the typical Japanese rider with long hair, Norick Abe. In 2004, Rossi and Abe are both defending Yamaha. Rossi was on the team Gauloises Fortuna Yamaha Team Gauloises Fortuna while Abe on the Tech 3 Yamaha Team. "Valentinik", the nickname is derived from the cartoon "Daffy Duck" is a "superhero" in Italy named Paperinik. The nickname was wearing at the time of the race in the 250cc class. Other nicknames is "The Doctor" as he rose in the 500cc class at the 2000 season. At the end of the 2003 season before the 2004 season, Valentino Rossi made a decision to move from the Honda factory team, Repsol Honda HRC. He chose to join the Yamaha team last won the world championship in 1992 by racer Wayne Rainey. Rossi moved to Yamaha team alone, it also brings Jerremy Burgess, a former chief mechanic also handles Doohan and Criville. They conducted a series of tests to fix the motor technology Rossi's Yamaha YZR M1 to be able to compete in the Moto GP motorcycle strongest at that time, Honda's RC211V. Regarding the move, many are not expected and pessimistic that Rossi will be able to retain champion title. But he parried all these pessimistic views. Even in the first series of the 2004 season in Grand Prix Welkom, South Africa, he beat Max Biaggi riding a Honda motorcycle, albeit with a very tight fight with the latter driving a Yamaha motorcycle was on the podium in 1992. 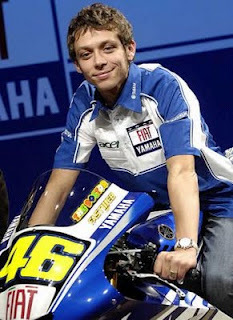 In 2004 and 2005, becoming the world champion Rossi with Yamaha and became the first Yamaha rider to win the most in a season (9-time champion in the season 2005).